The Grand Cherokee is set at the top of Jeep's SUV lineup, serving as the flagship model and boy does it deliver! Throughout the seven available trim levels, the Grand Cherokee offers high-quality interior, a variety of efficient and commanding powertrain options, off-roading and on-track performance features and equipment, and even the latest safety and security features that will protect and defend at every turn! 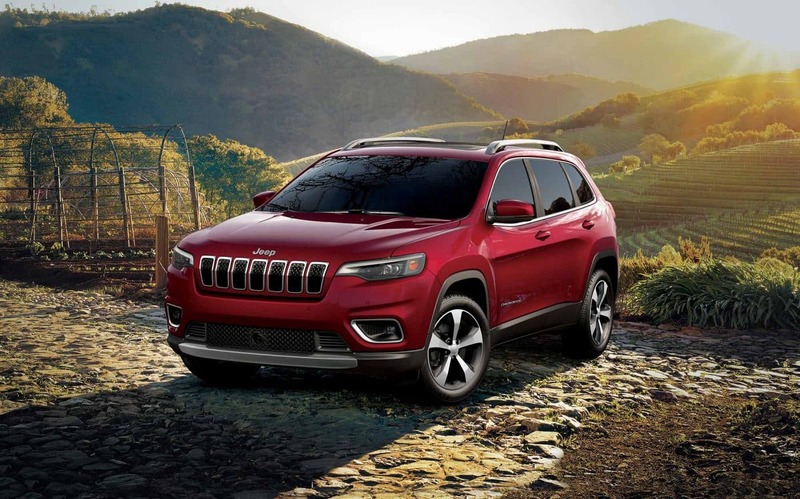 The Grand Cherokee offers so many new features for the 2019 model year including the addition of standard safety equipment and a larger infotainment touchscreen as standard on the Limited trim level and above. There is so much more to learn about the brand new 2019 Jeep Grand Cherokee so keep reading! What kind of features does the Grand Cherokee offfer? Jeep will continue to offer the Grand Cherokee in a total of seven trim levels for the 2019 model year, ranging from the entry-level Laredo to the performance-driven Trackhawk. A new special edition model is available and it is based off the Limited model. Known as the Limited X, the sub-trim offers features like Low Gloss Granite Crystal 20-inch wheels, a performance geared hood, an exclusive rear and front fascia, Granite Crystal exterior accents to set it apart, Heritage perforated seating, and unique interior design elements, and an all-black interior theme. This trim also comes with a nine-speed audio system that is boosted by active noise cancellation, and an 8.4-inch touchscreen with the latest Uconnect infotainment system. The Overland and Summit models also offer new wheel options. Jeep has also unveiled three new exterior colors for the 2019 model year. They include Green Metallic, Slate Blue, and Sting Gray, all of which are sure to stop people in their tracks. What kind of powertrain options does the Grand Cherokee offer? There are four powerful and efficient engine options available for the 2019 model year. First up is the standard Pentastar. This 3.6-liter award-winning V6 engine, outfitted with ESS technology, delivers 295 horsepower and offers towing up to 6,200 pounds! The available 5.7-liter V8 engine pumps out 360 horsepower and can tow up to 7,200 -- the best towing capacity in the class! For those who are seeking an engine geared for performance, the SRT will start you off with a 6.4-liter V8, outfitted with fuel saver technology, that generates 475 horsepower. On the track, this engine can sail from 0 to 60 mph in under 5 seconds and can drive the quarter mile in 12.8 seconds at a top speed of 160 miles per hour. For even more performance, the Trackhawk model is powered by a supercharged 6.2-liter V8 that creates a mind-blowing 707 horsepower. This engine can cruise from 0 to 60 miles per hour in under 4 seconds and covers the quarter-mile in just 11.6 seconds with a top speed of 180 mph. All four engine options are mated to an eight-speed automatic transmission. Does the 2019 Grand Cherokee offer any safety features? Whether you are on the highway, trail, or track the Grand Cherokee will have your back thanks to latest in-vehicle safety and security features! Stand out features for the 2019 model year include LaneSense Lane Departure Warning system with Lane Keep Assist -- this technology helps you keep your position within the lane and warn you if you drift without intention, it can even correct the drifting or you, Automated Parking systems -- help you park in those tricky perpendicular and parallel parking spots without an issue, and the available Valet mode on the SRT and Trackhawk models -- this technology limits the SUV's power so the valets (or even teen drivers) can't access the full potential of these performance geared SUVs! No matter which trim level that you opt for, you have no reason to worry because it will have your back day in and day out! The 2019 Jeep Grand Cherokee is a mind-blowing SUV that has something for every type driver! You can learn more about all the new features and trim levels offered in 2019 by filling out the contact form provided below or giving our sales department a call!